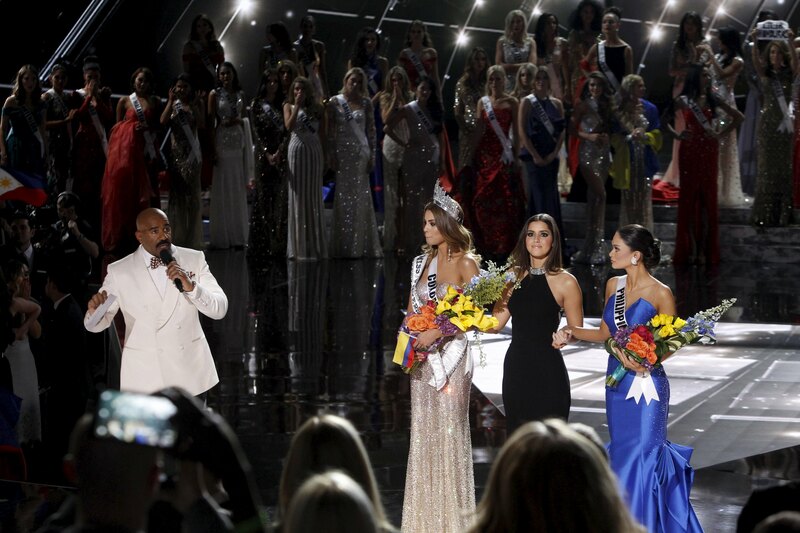 The comedian had a lot of explaining to do when he met with the press after the show, and copped to his "honest mistake," all the while explaining how he managed to confuse the pageant contestants in the first place. Harvey said that he accidentally said Miss Universe instead of first runner-upwhen he called out Miss Colombia, and realized it later upon looking at his note card. "I just kept reading the card and it said, 'First runner-up,' and I went 'oh my goodness,'" Harvey recalled. Throughout the press conference, Harvey owned up to his mistake, and also took to Twitter to say sorry to both pageant contestants. "I'd like to apologize wholeheartedly to Miss Colombia and Miss Philippines for my huge mistake. I feel terrible," he wrote. "Secondly, I'd like to apologize to the viewers at that I disappointed as well. Again it was an honest mistake. I don't want to take away from this amazing night and pageant. As well as the wonderful contestants. They were all amazing."